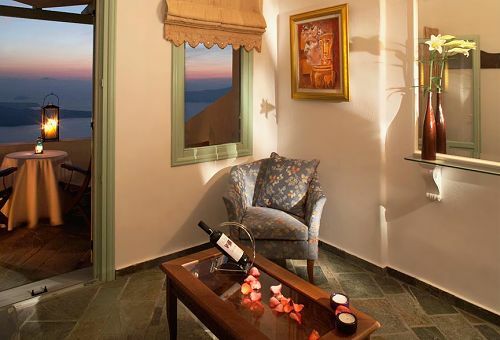 Situated in a quiet and tranquil location, in close vicinity to the volcano and perched high on the very edge of the Caldera of Santorini, Ira Hotel offers an amazing panoramic view of the volcanic isles, the far horizon, the deep Aegean blue sea and the famous Santorini sunset. 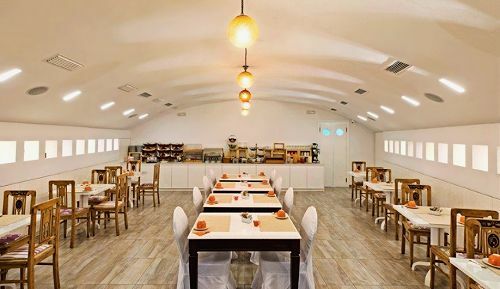 The hotel has been built, renovated and upgraded, with all respect to the local architecture of Santorini, a complex of luxurious, traditionally styled standard double rooms and suites. 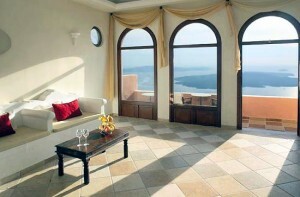 The hotel comprises of 2 buildings, the Caldera View building and the Village Dwellings. The Caldera View building was renovated in 2007 – it is built on different levels following the cliff’s descending incline. 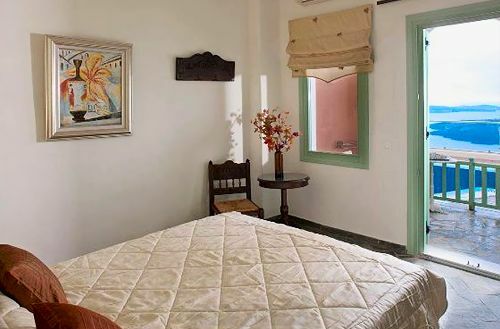 In a perfect blend of luxury, comfort and tradition, all the rooms are elegantly furnished and decorated with the amenities of a modern complex. 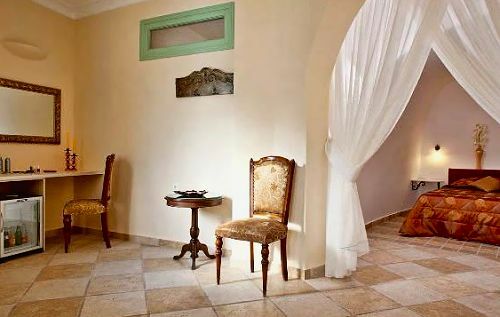 Each room bears the name of a god of ancient Greek mythology and is accordingly decorated. 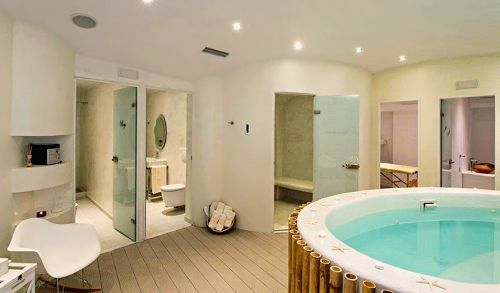 In the caldera building the standard rooms are on the swimming pool level and have a private veranda and shower in the marble walled bathrooms. The superior rooms and suites are on the upper floor, built mostly in split levels with a private balcony and a whirlpool hot water bathtub. The Traditional Village Dwellings were built in 2007. 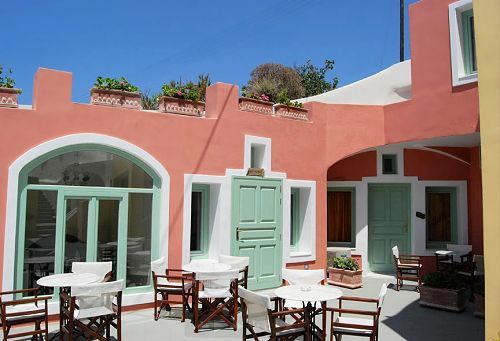 Traditional Santorinian architecture looks on to a terrace with local pottery, flowers and corners with relaxing sofas, tables and candle lights. 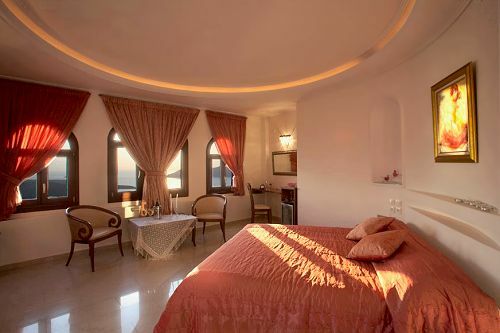 The village dwelling rooms have the characteristic domed ceiling of Santorini and are furnished with antiques and old embroideries and bathrooms equipped with showers of glass mosaic walls. The hotel features a swimming pool with Jacuzzi jet streams, internet corner, 24 hours reception desk and public parking. This hotel was nice. Again not the best linens and a quite small room. But I loved it. Hotel staff were very kind. Hotel Ira is good. 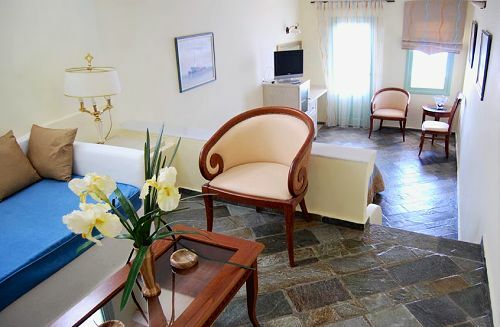 The hotel Ira was excellent with friendly staff and a convenient location to walk most areas of Fira and the rim. Our view was outstanding, as we were right on the rim, and the sunsets and views were remarkable. As it was an anniversary celebration that brought us to the island, the extra touch of a gift of wine from Dolphin Hellas was most gracious and a wonderful surprise. 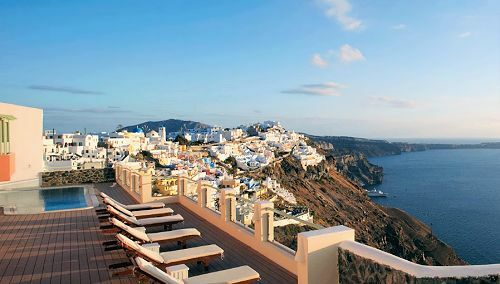 We would absolutely stay there again if we travel to Santorini. Beautiful hotel in a great location. Spectacular views of the caldera.